But, no social commentary today. Let’s talk about that wine and cheese instead. I’m not kidding when I say that Room 11 is tiny. The inside space, quirkily decorated down to funky bat wallpaper in the restrooms, is not conducive to any large gathering or crazy partying. But that’s not the purpose. 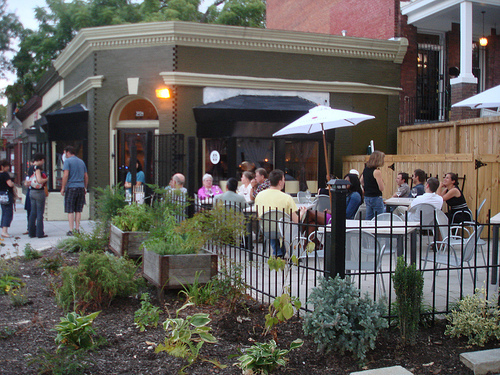 This is a neighborhood spot to hit on your way home for a nightcap, maybe a light nosh. If I were to need a solo drink, this is the bar I would hit, as it’s extremely easy to strike up a conversation and meet new people here. It’s also economical, with a wine list ranging from $6-10 a glass and $8 cocktails crafted by Dan Searing. The price point is reassuring and shows a dedication for keeping the neighborhood feel. I enjoyed Castelo de Medina verdejo and Las Felices viognier while nibbling on a selection of cheese and charcuterie – of course! – simply presented, all the usual suspects, not quite as exciting as other charcuterie plates in the city. Later, Punto Final malbec hit the spot paired with the Lamb Cutlets with mint chatni. Another night saw me sipping Pirate Tea – dark rum, PG tips, lime syrup and sugar – that went down smoothly. More exciting was the Floradora, a delicious concoction of Hendrick’s gin and raspberry liquer. Considering I just had one at Quill too, maybe it’s time to break out the corset in honor of the Belle Epoque drink revival. Not on the menu, it was served as a sample shot to everyone which again added to the neighborhood cocktail party atmosphere. I’ve no doubt sitting at the bar and just asking “what’s your favorite mix tonight?” is the way to go. Beer lovers will be happy with an interesting selection from Victory Hop Devil Draught to Rasputin Imperial Stout, at prices from $6-10 again. And I was extremely happy to see white port offered, one of my favorite indulgences. My accomplice on one visit was WLDC foodie Katie, who wasn’t particularly impressed by the Tunisian meatballs (dry that night) or the special of bean and onion crostini spread, elliciting an “eh” on all counts. The food was not the highlight for me either. It’s a simple, small menu more in line with the cafe feel rather than striving to be a dining destination. I don’t think that’s their line, which is perfectly fine. Surprisingly the dessert menu is the most intriguing, offering five pastries by Paisley Fig including their famous honey goat cheesecake and a lemon olive oil cake, which makes me wonder if I should start my next visit there with the sweets instead. It’s been about a month since Room 11 opened and I think it’ll be interesting to watch how it develops. The best thing to come out of a little spot like this opening is that others will see it can be done and follow the lead. The artifical development of 14th Street in Columbia Heights is making the organic development of the old retail corridor of 11th Street possible. More is needed. All I have to say is: eat before you go. Room 11 is great for an intimate drink. If you’re looking for more of a boisterous and loud time, Wonderland is down the block. But if you and your honey want to snuggle and whisper sweet nothings to each other over a glass of wine, Room 11 is a good spot. I hope that they put heat lamps on the patio for the fall. And I agree, that bat wallpaper rocks! Give the food another try. The Market Salad I had last night was amazing and the Mushroom and Leeks made me love mushrooms again. The Honey Goat Cheesecake was just stupidly good….